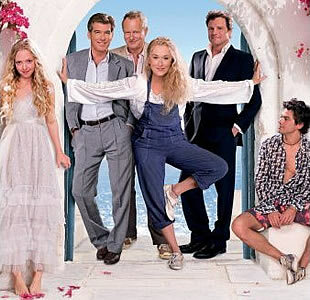 Guide to the London stage musical "Mamma Mia!" 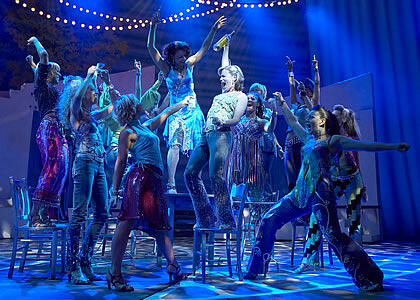 This page is a brief guide to the stage musical Mamma Mia! 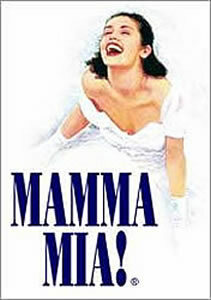 It is currently being staged at the Novello Theatre in London's West End. The Novello Theatre is in Aldwych, London, WC2B 4LD. The nearest Tube stations are Covent Garden, Charing Cross or Temple. The running time (including the interval) is 2h35. 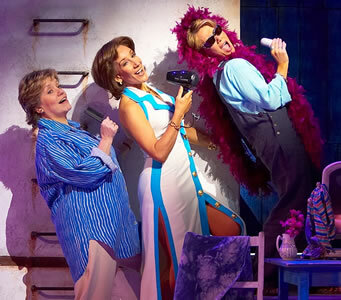 Rosie, Tanya and Donna sing "Dancing Queen"
The women sing "Gimme! Gimme! Gimme! (A Man After Midnight)"
Sophie is about to get married. She has been brought up by her mother on a Greek island, and has never known who her father is. However, Sophie discovered her mother's old diary and learnt that her mother had affairs with three different men (Sam, Harry and Bill) shortly before she was born. Sophie has secretly invited all three men to her wedding, thinking that she will be able to recognise her father when she sees him. She wants her true father to take part in her wedding ceremony. Sophie's mother Donna has invited her two best friends (Tanya and Rosie) to her daughter's wedding. The three of them used to be in a band called Donna and the Dynamos and had a lot of fun together. 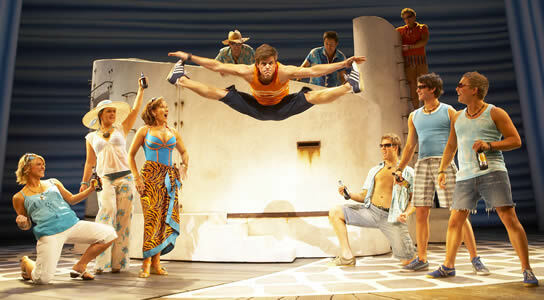 The musical follows the chaotic events from the arrival of the guests on the island to the wedding day itself. The range of emotions and different types of relationships are brought to life using songs which were originally written and performed by the Swedish pop group Abba. Abba took its name from the first letters of the names of its four members: Björn Ulvaeus, Benny Andersson, Agnetha Fältskog, and Anni-Frid Lyngstad. English: The story is simple and easy to follow. Age: Suitable for adults of all ages and for teenagers. The language used includes some mild sexual references. Mood: This is a feel-good musical with many comic moments. Music: You will enjoy this show if you like Abba's songs. The tunes are very catchy and can appeal to people of all generations. The film opened in the UK in July 2008. To see the film trailer: click here. The main film locations are in the Greek islands of Skiathos (map) and Skopelos (map).